Bring your best friends, your sister, your mom or your daughter for a weekend you’ll remember for years to come! Recognized as one of The Top 10 Women’s Races by Shape Magazine, ZOOMA Texas Wine Country Half Marathon is a race weekend you simply don’t want to miss! FRIDAY NIGHT FUN + 5K. Pick up your race packet and shop, hang out and have fun with your crew! Shake out those running legs and join us for the Friday night 5K! RUN. Gorgeous runs through the heart of Texas Wine Country in Fredericksburg, TX. Run a 5K, 10K or Half Marathon or combine the distances into our new Wine Country Challenge! Complete the Friday night 5K + Half Marathon or 10K to earn the Wine Country Challenge medal! Want to register for the Texas Two Step Challenge? 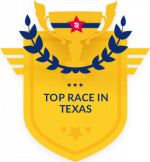 Just register for the ZOOMA Texas Lost Pines and Wine Country race weekends (10K or 1/2 Marathon) and you’ll automatically be qualified for the Texas Two Step Challenge! A variety of resorts will be available for your stay at in the Fredericksburg area. Please note that you’ll be responsible for your transportation to/from race day. Travel Tips + Info coming soon! We are proud to partner with Girls on the Run of Austin as our Official Charity Partner for ZOOMA Texas Wine Country Half Marathon! There is no race day packet pick up for the Half Marathon or 10K unless you purchase the Race Day Packet Pick up. Please pick up your packet on Friday or purchase the Race Day Packet Pick up option.